Persona 4: Dancing All Night game and all of the items are contained in a collectible outer box! A colorful and exquisitely detailed P4D-themed PS Vita pouch (previously only available in Japan) and a North American exclusive embossed Teddies keychain. Two CD’s of Shoji Meguro’s music from P4D (classics, remixes & new songs) and bonus “Never More” playable song. 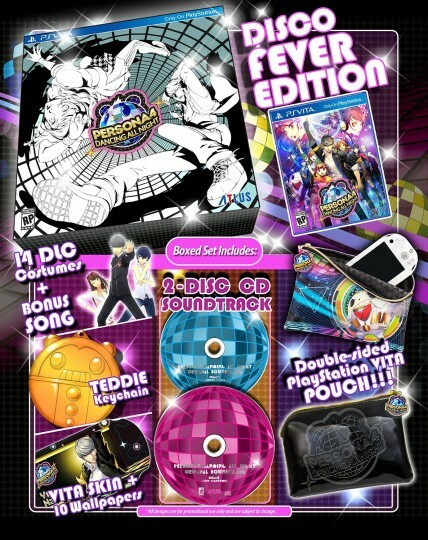 An exclusive P4D-themed PS Vita skin along with 10 P4D wallpapers. Two sets of DLC outfits (Gekkoukan High School uniforms & summer break outfits). 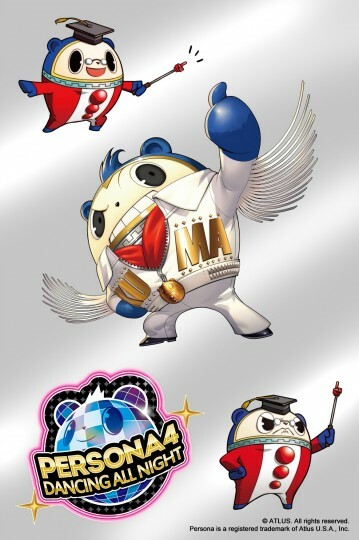 Just for Amazon customers, these special-issue foil stickers starring Persona 4: Dancing All Night’s Teddie are yours to use wherever you need a little Bear-dazzling! Exclusive to Amazon in North America. This entry was added to the database on Thursday, July 23rd, 2015 at 8:02 pm by Letrico. This information was last updated on Saturday, May 7th, 2016 at 9:54 pm by .